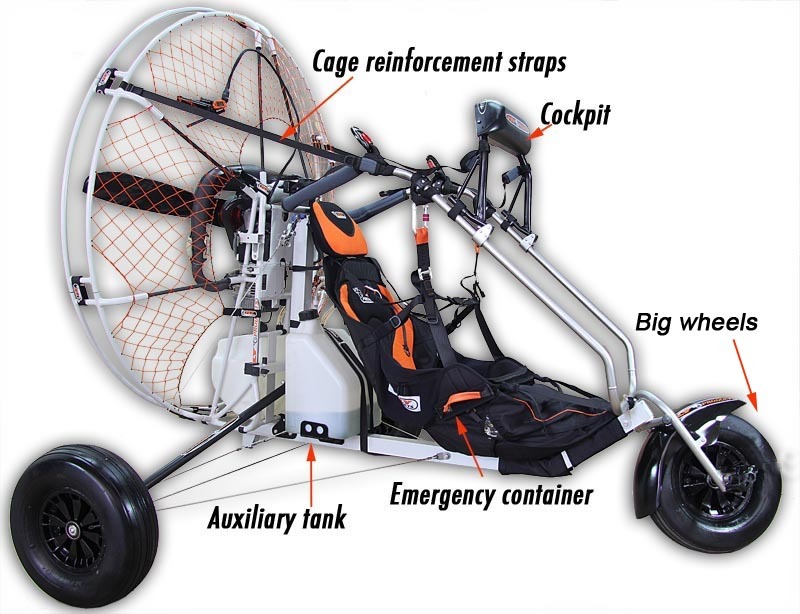 The Flash Cruiser is sold without motor, you can apply to it all Fly Products paramotor range. It is designed for the best comfort in single-flight. It has a very comfortable seat and the point of support of the feet has been improved, it' perfect for long flights. It's very easy to take off on sand as well, with its wide wheels. The support points of the front wheel are different from those of the trike Flash. In order to use the trike tandem version you should purchase the two-seater kit "see photo below"
It is fitted as standard with a 16 liter fuel tank, then 2 tanks are available for more fly autonomy. It is equipped with A assist system with Cockpit where you can apply various flight instruments. The cockpit is included but the instruments are optionals. The auxiliary tank must be removed in tandem version. Kit biplace for Cruiser tandem version. Click the button below to add the FLY Products Flash Cruiser to your wish list.